If you're in NOLA and it's breakfast time, the choice is obvious: beignets and cafe au lait. But even if you're well outside the city limits, you can still enjoy these New Orleans staples thanks to a crucial recipe from Glazed and Confused. His spin transforms the usual cup of cafe au lait into coffee ice cream, and the beignet into the bread that holds this delectable ice cream sandwich together. Wanna make them yourself? Of course you do. The beignet recipe is based on the famous ones out of Cafe du Monde, so rest assured they're gonna be good. Once you've molded your dough, you need to let it chill for up to 24 hours. So in the interim, whip up the no-churn coffee ice cream with a combo of heavy cream, condensed milk, espresso powder, and Kahlua. Then let that sit in the fridge for a minimum six hours. Once everything's sufficiently cool, fry and powder your beignets, slice 'em in half, and scoop the cafe au lait ice cream in the middle. 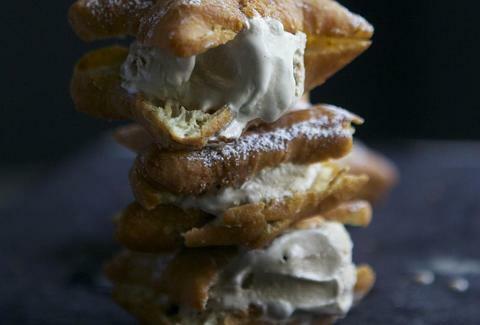 Your creation is complete, and all of a sudden, glazed donut ice cream sammies seem hopelessly boring. Kristin Hunt is a food/drink staff writer for Thrillist, and feels weird about the fact that she's craving ice cream sandwiches in September. Follow her at @kristin_hunt.